This Joshua & Sons timepiece features a polished case and bold bezel. The outer dial is designed with concentric circles and the inner dial is decorated with a pyramid pattern. Powered by Swiss quartz, its complications include a quick set date arc. I can't tell you how many compliments that I have received from the Red Joshua & Son's watch. I have a great collection of different watches along with tennis shoes. I have always tried to set an example of being a well dressed & coordinated person proud of my appearance. I am not 1 who subcomes to what everyone else would consider normal. I have always believed in being yourself & be proud of it. I was born with a full head of long hair & will die with it, I see no reason to change it to change the perception of what someone thinks about me. I wear a vast variety of different colors & the Joshua & Son's watch helps to tie all of my red shirts & red tennis shoes together. I have been very satisfied with my purchase & have told many people where they would be able to purchase 1. Hopefully I will be in the position soon to be able to purchase the matching Blue 1 to go with the vast assortment of my blue leisure attire & tennis shoes. A good quality watch. But probably for special occasions as parties and Christmas or younger wearers. Strap replacement with same red color may be a problem. 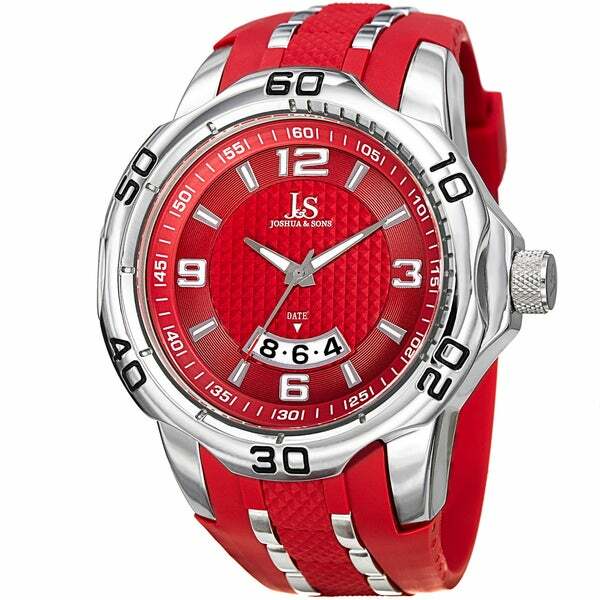 Love this watch and the color red really stands out plus it's a Joshua & Sons good brand. I would definitely recommend this watch. The only thing the face of the watch sometimes feels heavy on my wrist. When will the black one be available. There was a white one in this fashion will it be coming back soon im waiting on the black and silver one. Thank You. What a bold statement! It is my fun Friday watch. Great price!!! I love it.......and hope to continue the pleasure of wearing it. Thank you very much! My son loved it, I enjoy shopping with for gifts and my home. Love this watch an getting more of them! The watch was exactly what I wanted for a gift. However when it came it was perfect, but, it was WAY too big. Had to send it back. Very well made. No complaints. Lots of compliments. "may I order a new watch band for this item?" I selected it for its high visibility color, large watch face and date. I have purchased watches before from overstock and have always been highly satisfied with the products and service.